Unit is 69” square x 204” tall and painted with a standard blue PPG Durethane finish. Unit has a maximum product capacity of 2,800#. 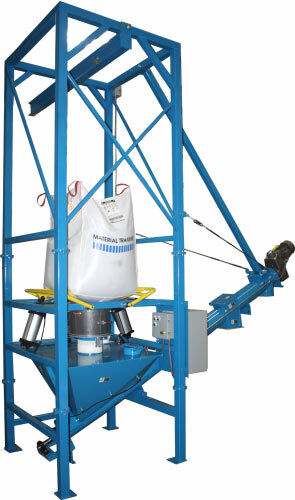 Includes a customer supplied 2-ton electric wire rope hoist with motorized trolley (not shown), monorail, and our exclusive Spider-Lift™ bulk bag lifting frame. Unit includes our patented aluminum /UMHW Flo-Lock™ gate for partial bag discharge. Unit features an aluminum Seal-Master™ bag spout access chamber with “gull wing” doors for optimal operator access to the bag discharge spout. Custom lower frame includes structural supports for the customer supplied conveyor.